February | 2014 | Lagusta's Luscious! breakfast soup: a way of life. When Jacob and I were on vacation in Hawaii in January, we got a big bag of organic quinoa and made some for breakfast every morning. Coconut milk, maple syrup, some local fruit, some nuts, and hot quinoa. It was great, and I felt great. But I knew I wouldn’t be up for quinoa breakfasts when we got back home, because when I’m in work mode (11 months out of the year), I wake up and want to get to work and start working, not making food since making food (well, candy) is my job all day long. Also I got really tired of quinoa. In an attempt to get me to continue the quinoa thing, or some kind of breakfast thing, since its effects (calm clearheadedness, minimal food-rage outbursts) were obvious, Jacob turned to me one day and said dramatically, “I would like to invite you to join me in a club. A secret club. And how do you say no to that? We talk a lot at work about Ways To Not Become Crazed With Hunger, for two reasons. First, most of us at the shop are women and women are taught by a patriarchal society that martyrdom is an exalted and appropriate lifestyle choice and therefore putting aside one’s own desires (i.e. eating when hungry) in favor of serving a wider society (i.e. getting more done) is OK. Second, because the nature of working at the shop is to just bump along from one thing to another thing then to get interrupted from those things by another thing, so that soon five hours passes and you’re not only working on five things at once but also you suddenly and with a huge flash of rage-hunger realize you passed a few hours ago the calm and sane equilibrium that rational and regular meal consumption provides. We are all working hard to not do this. Kate is our breakfast inspiration, really. Last fall, Kate, who is better at eating meals than anyone I know, gave us a Snack Seminar which attempted to get us to eat more regularly. Her other big campaign is for everyone at the shop to eat breakfast. She’s probably the only one who eats a true breakfast every morning: a serious meal, complete with pour over coffee and multiple home-cooked components (tacos! avocados! sautéed greens! pancakes! wraps! sometimes all on the same plate!). The rest of us traditionally either grab whatever’s hanging around, or eat nothing at all. I wake up with lots of morning energy that I’m desperate to harness, so I get to work as quick as possible in order to have a little quiet time before the rest of the crew arrives. This habit is not conducive to a morning meal, and I usually feel the effects around 1 PM, when I suddenly want to kill everyone in the immediate vicinity and desperately eat a Turtle because I tell myself that at least it contains protein (five pecans!). Most of us at the shop are giving a really good go of The Breakfast Club 2014. Maresa’s doing something involving soy yogurt and a special kind of muesli, Jacob transitioned straight from quinoa into oatmeal then grits then steel-cut oatmeal then back to quinoa again, Erin has minions of girls willing to bring her a bagel with tofu cream cheese with a quick dispatch of the shortest of texts. We’re trying. Brendan is still living on cigarettes, Marena on ketchup packets from The Bistro, but we’ll all get there, eventually. My thing is Breakfast Soup. I’ve been doing it around a month now, and maybe it’s too early to say it’s utterly and completely transformed my life, but I’m going to say it anyway. 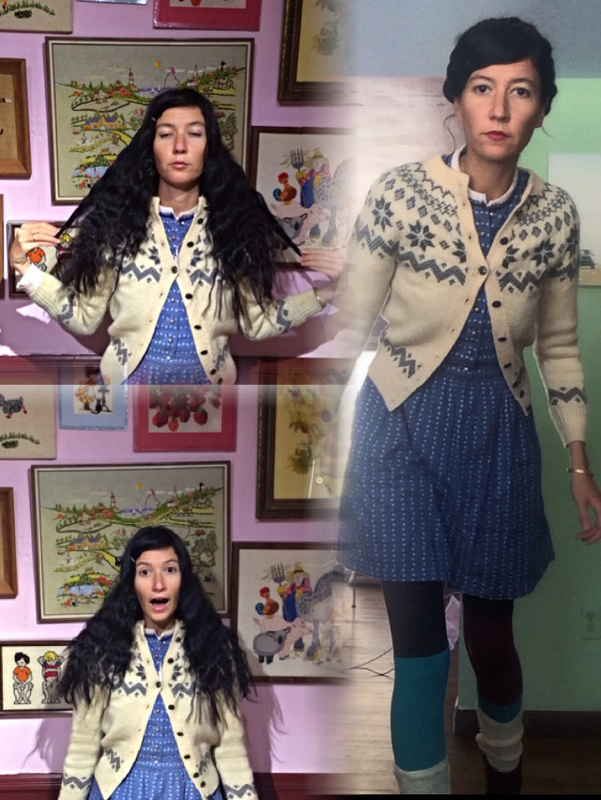 Breakfast Soup fits me like a fair isle sweater with a floral Lanz dress, mismatched leggings and hair that’s wild from being contained into Heidi braids all day: it’s weird, and I freaking love it. I love it much that I want everyone to be eating it. So here goes, my attempt to indoctrinate you into the cult of breakfast and specifically into the ways of Breakfast Soup. Breakfast Soup is an almost-instant meal. I make mine once a week or so, and once it’s made it’s ready in the time it takes to boil water for tea (if you have a wild fancy induction stove like we do at the shop, this is 1 minute and 30 seconds). The making of the soup itself is quick too. In truth I’m sort of always making soup, and because of that it takes almost no time at all. I just sort of set aside scraps for it from meals throughout the week, and it makes itself. More about this below. I prefer not to do this, because I love BS so much I never want to get tired of it, but on ultra-rushed days BS can easily become LS: Lunch Soup. Add some noodles, fry up some vegetables and toss it in, and you have more of a hearty meal. Breakfast Soup is a perfect and elegant way to efficiently use leftover scraps of food, which makes it mighty cheap. Breakfast Soup is protein-heavy and sugar-free, which are important components of a meal if, say, the rest your day involves mandatory sugar consumption. Though I joke about eating two doughnuts, in reality I heavily monitor my sugar intake, and don’t want to waste it on a gross sweet breakfast when I have to make RSSCs or something later in the day and need to taste appropriately. I want to describe to you how good Breakfast Soup makes you feel. You feel good on two levels: you’ve eaten a healthier breakfast than anyone you know and therefore have bragging rights all day (and I know not what makes one feel better than bragging rights) but you also literally feel amazing because you’ve eaten the healthiest breakfast of all time. It truly is a magical meal. Everything good in life should include miso, and BS does too. If it wasn’t already midnight and I had more time to put into this manifesto I’d Google around to find you stories about Japanese citizens who ate miso soup every day (for breakfast!) & got radiation sickness when we dropped horrifying bombs on them at much lower rates of other Japanese who had abandoned this traditional practice. So not only does Breakfast Soup make you feel good in the moment, who knows what the future may hold and maybe it will prevent against horrors yet to come as well. Man oh man that got dark. Let’s move on to the recipe and stop thinking about World War Three. Stuff that goes into the broth. Things you add in at the end. The broth has to be made from kombu or kelp. There are very few rules to Breakfast Soup. There is actually only one rule to Breakfast Soup, and this is it: make a dashi (the Japanese term for a broth made from kombu). Without dashi your soup will be bland. Let’s talk here for a minute about breakfast flavors. In my previous life as a savory chef, I prided myself on how much I pushed my flavors. Because people think of vegan cooking as bland, I made sure my dishes were balanced and flavor-forward like crazy. More acid! More umami! More richness! Those three are still my trifecta. Rarely can a dish not be improved by lemon zest, shoyu, and olive oil. Or vinegar, porcini mushrooms, and ground cashews. Or yuzu juice, tomato paste, and coconut milk. Acid/umami/fat—my babies. But breakfast is different, obviously. My BS is savory, but not bursting with flavor. It still has a breakfast vibe, and it’s important to preserve that. I don’t want something super acidic, or very rich. My BS has almost no fat in it at all, which differentiates it from 99% of the other dishes I make, which are pretty fatty. I feel best when I eat a lot of high-quality fats: olive oil, tons of nuts, lots of avocados. But not at breakfast. So I hold myself back when making Breakfast Soup, but I also don’t want a plain, flavorless, watery breakfast. There is a fine line between purity and elegance of flavor and blandness. Classical Japanese cuisine, particularly the naturally vegan shojin ryori style I’m obsessed with, walks this line with elegance and style, and I want my Breakfast Soup to do the same. All this is to impress on you how essential kombu is to the dang dish. Kombu is this huge thick seaweed. You don’t need to eat the kombu, is the thing. If you don’t like sea vegetables, just tell yourself you’ll only use it to make the dashi. Within a few weeks I bet you’ll be doing what I do: using it to make the dashi, then using scissors to cut it into bite-sized pieces you then add back into the soup because actually the taste is pretty lovely. 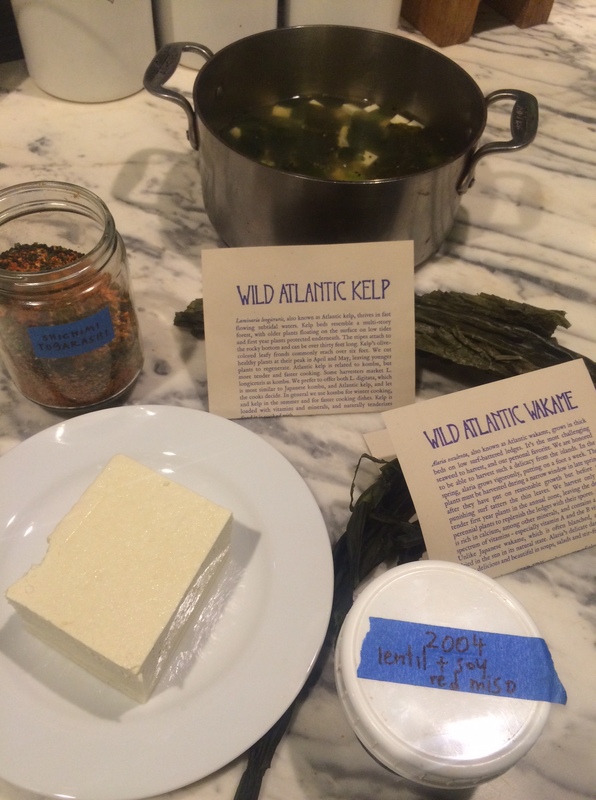 I get my kombu and kelp from Ironbound Island sea vegetables, in Maine. I started buying from them because Sandor Katz recommended them and I love Sandy so much. I kept buying from them because they have the best, and most local, sea vegetables I’ve ever tasted. If I have a headache from eating too much sugar, their dulse brings me right back into balance. I nibble on it plain, it’s briny and amazing and I’m alive again. Then, when some nuclear reactors melted down in Japan and the fallout can still be measured as far away as California, I decided to be more circumspect with the Japanese foodstuffs I buy. 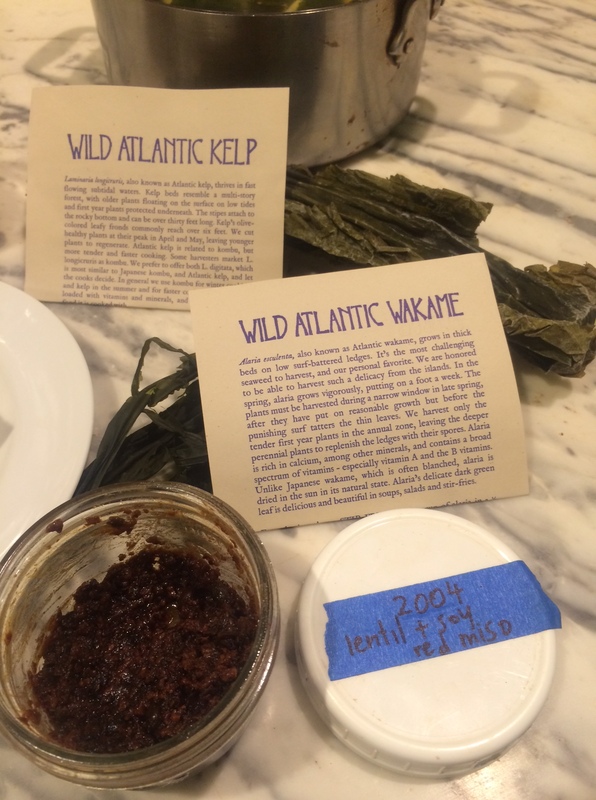 So now I use Maine sea vegetables out of love for their flavors and also fear of more far-flung seaweeds. What a tragic world we live in. Seriously! 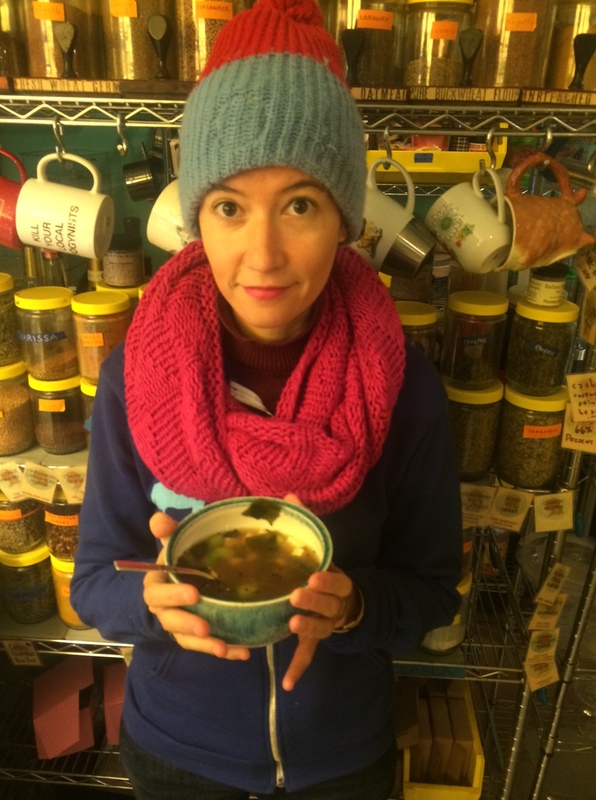 I promise that if you eat Breakfast Soup for two weeks straight you’ll crave that seaweed, and all its trace minerals, its natural iodine and anti-carcinogenic properties, like crazy. Promise. I’ll give you a caramel if I’m wrong, OK? Call me on it! 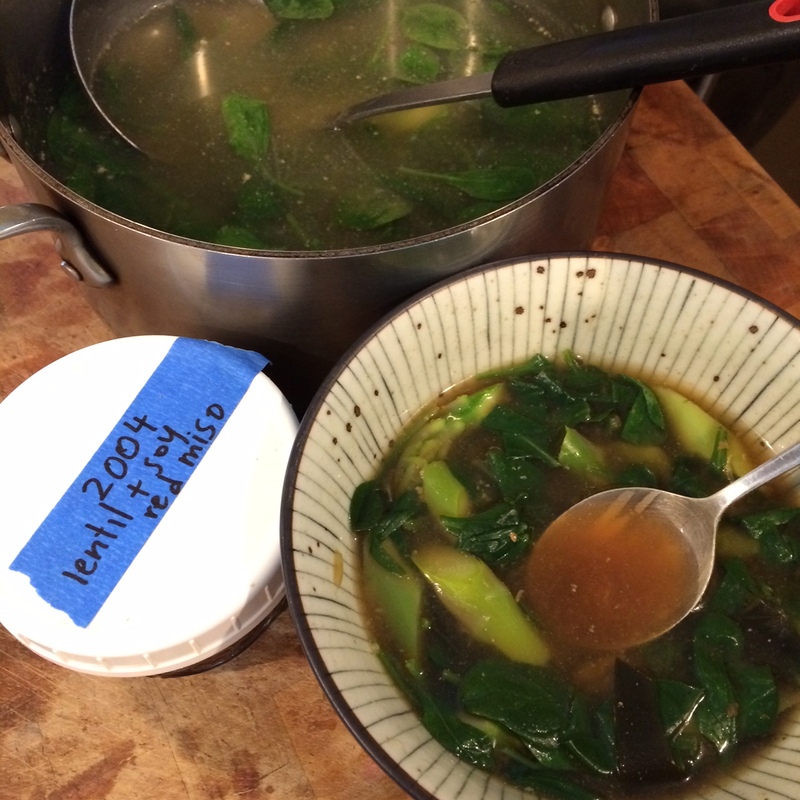 So kombu is the thing that saves Breakfast Soup from being bland. You could use some dried mushrooms in addition. Just bring some cold filtered water to a boil, toss in 6″ or 12″ of kombu or so, and simmer it for a while. A half hour, fifteen minutes—whatever. It’s good to do this at night, then let the kombu sit in the broth overnight. There. You’ve made dashi. Take out the kombu and throw it out or chop it up and put it right back in. Broth: done. But there’s an easier way to make the broth, too. Yep, easier than adding one thing to some water and bringing it to a boil. Every time you cook something tasty and not in the cabbage family (cabbage, bok choy, broccoli, cauliflower, brussels sprouts, etc), save the cooking water. Pasta, potatoes, the water under your vegetable steamer, etc. Put that water in the fridge with some kombu in it. No need to heat it, especially if the water is still hot. Instant dashi. In time, when you get into the flow of Breakfast Soup, you’ll find that while you’re cooking throughout the week you’re sort of unconsciously thinking about ways to steal parts of your dinner you ordinarily would have thrown out for BS. Mushroom stems, onion and carrot and potato peelings, even scraps of lemon rind: put them in the same container with your kombu stick. When you run out of BS and need to make a new batch, you’re mostly done already. You really need very very little stuff that goes into the broth. It depends on how hungry you are and what you like to eat in the morning. Also on what’s in season, and how much money you can spend. Sometimes I feel really unhungry in the morning. 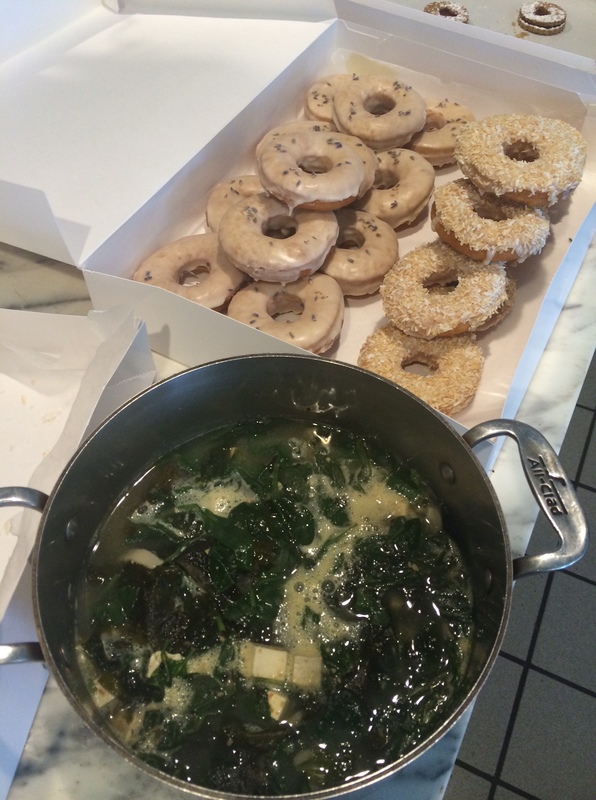 On those days I basically make Breakfast Soup Tea: just broth and miso soup and maybe some spinach leaves. Most mornings I add wakame to the soup (two seaweeds, I know I know what a hippie) and something green. Right now, much to my locavore heart’s horror, that something green is either pre-cut pre-washed baby kale you get in plastic boxes at the health food store, or asparagus, because for some reason my health food store has had a good price on California organic asparagus for two weeks now. New Paltz asparagus won’t be up for like three months, but I am enjoying fragrant asparagus pee now! Decadent. If you’re a better locavore than me, you can use local homegrown greens you’ve frozen or fermented in your soup. 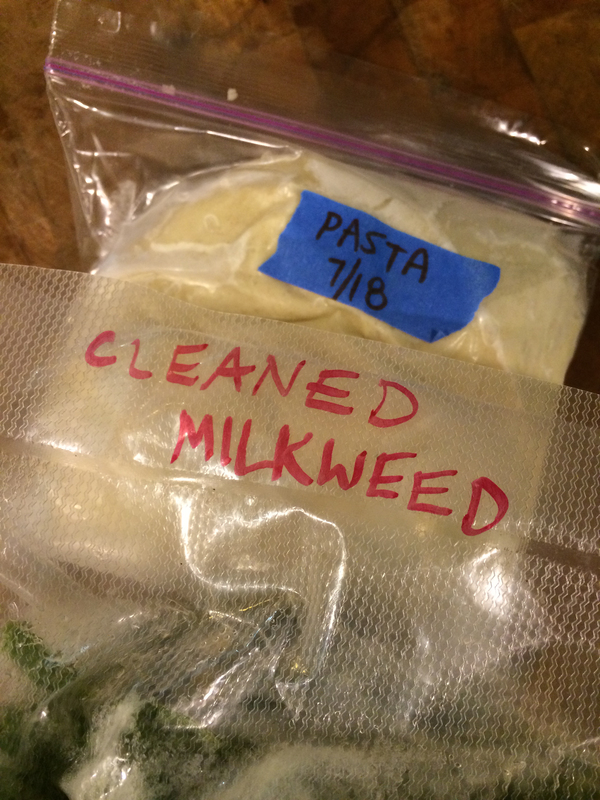 I defrosted this vacuum-sealed milkweed to put in my BS, but then I saw some pasta dough in the freezer too, and instead I mixed it with soft cashew cream cheese and made little raviolis for dinner. Oh wintery freezer! Sometimes you’re OK, you know that? I shy away from noodles or root vegetables in my soup, unless, as I said, I’m making it into a rare Lunch Soup. Lightness and freshness is my whole thing, again. Herbs are nice, leafy ones like cilantro and parsley, or chervil and tarragon if you’re getting fancy. The tops of celery, those tender, celadon leaves, are nice. Fennel tops, too. Anything gently green. beet greens wouldn’t be my thing here, nor swiss chard. But baby spinach, sure. You can put in whatever you want. I tend to put greens and herbs and other fresh things into each little morning batch instead of reheating the entire soup every day with them in it, so they are still green and fresh-tasting. Usually when I’m making soup I want to pump up that savory umami richness so I sauté most everything that goes in it in olive oil for another layer of flavor, but for Breakfast Soup I just drop it in the broth (which you want to strain first if it has things like onion peels and stuff in it, naturally). I’ve been getting little bags of maitake mushrooms and adding them too, thinly sliced. If I don’t have any sometimes I add some dried porcini mushrooms or thinly sliced cremini or shiitake mushrooms. A friend gave me a Woodland Jewel DIY oyster mushroom kit for Hanukkah and it’s still pumping out little oysters I’ve been adding, too. Basically, add any kind of mushroom you like. Mushrooms are a gentle way to add deep flavor. At this point I also add either shoyu (good-quality soy sauce) or tamari (for gf buddies). Sometimes if I want the soup to be extra comforting and warming I add either some spicy sesame oil or toasted sesame oil, too. When/if we ever get out from under four feet of snow, Breakfast Soup will make an ideal use for the little bits of foraged foods that you can easily collect in the springtime. The first dandelion shoots, tender and sweet, field garlic, garlic mustard, wood sorrel, chickweed, wild lettuce, maybe a morel here and there, even—Breakfast Soup can be almost free with a little effort and a little bit of help from a springy earth. As you can see, the stuff you put into your broth is absolutely a matter of personal preference, but I have strong ideas about what you should make your broth from. Similarly, I want to really really press for you to add miso to your soup. Otherwise it’ll be bland and sort of not useful, really. Miso is a very powerful food, and I’m convinced it starts your day with magical powers. You need to treat it with some care however: add a little broth to your bowl, then mix in a spoonful of miso and the rest of the broth. This way you won’t boil the miso and kill all the fermented loveliness of it. You can just get plain old Miso Master miso from the health food store, or any brand from an Asian market (just make sure it’s made from organic soybeans, so you’re not eating a bunch of GMOs for breakfast), but if you want to treat yourself right, make your own miso (Wild Fementation, the Art of Fermentation, and The Book of Miso all have instructions) or buy South River Miso’s luxuriously handcrafted misos. They sometimes release seasonal misos (ramp miso! dandelion miso!) that are worth waiting for. I ramble on a lot more about miso here. 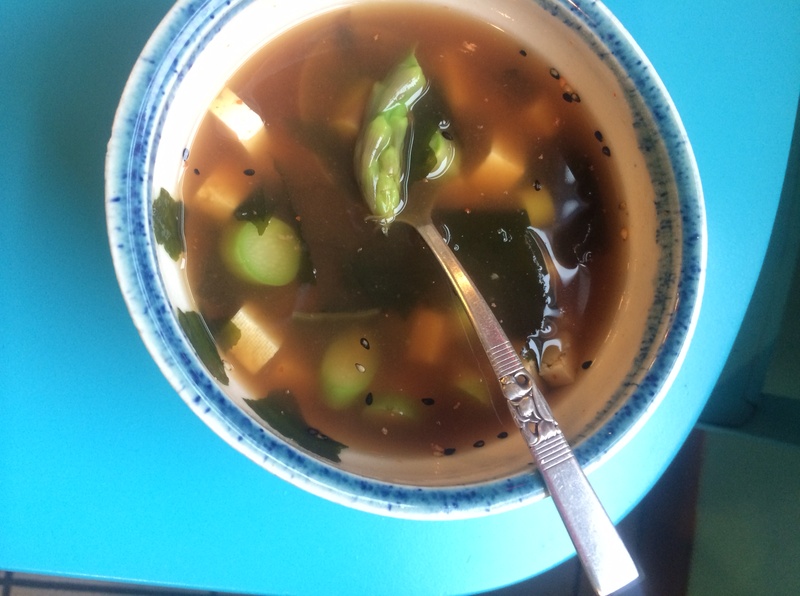 And this is a blog post I wrote about many many other ways you can use miso. I REALLY LIKE MISO, OK? I finish my soup off with two more elements: scallions, if I have them, sliced super thinly, and a lot of shichimi togarashi. 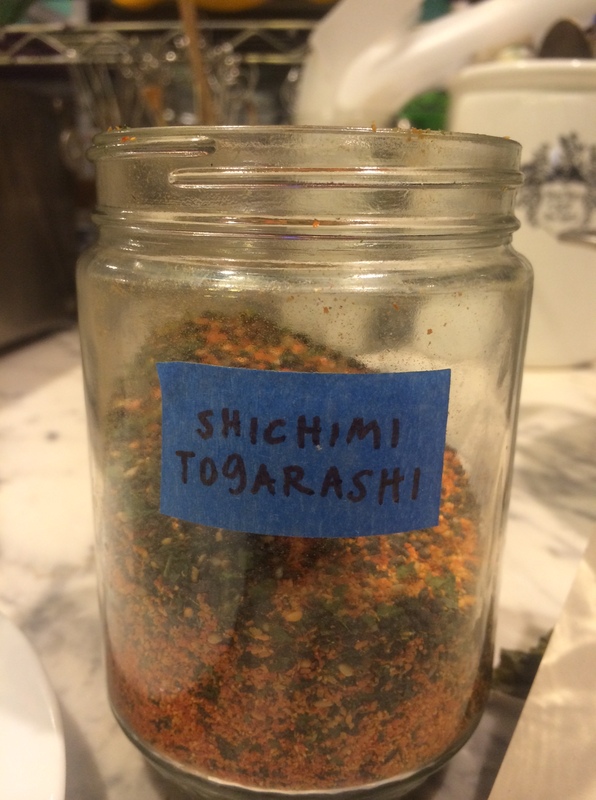 When I tell you that shichimi togarashi is a spicy Japanese condiment you’ll immediately think, “cool, I’ll use sriracha,” and you so totally can use sriracha. I love sriracha too! But shichimi togarashi is more than just acidic and spicy, like your roostery BFF: it’s a blend of seven spices and they all add up to the finishing touch for a soup that’s well-rounded and deep without being heavy or unbreakfasty. Yuzu peel, sesame seeds, a lil bit of ginger, chilies, a tiny bit of nori (third seaweed of the day and you’re only at breakfast!!! )—it’s a whole world of a meal in of itself, but it’s never overwhelming (though it does get crazy spicy if you add too much, so go slow). For a meal which takes 10 minutes to make enough to last a week, I sure managed to ramble a lot. I hope it’s been useful for you. Go make some soup!! And let me know how it goes.